The Walton Trail is, more or less, a tour of the parish of Walton as it is completely within it’s boundaries. This trail is quite varied as it includes the lake, the river, the Caldecotte Brook Linear Park and a sub-urban part of the National Cycle Route 51 The route also includes a tour of the Open University Public Art Trail, should you be so inclined. The national cycle routes are an England wide network of waymarked long distance cycle routes – see the Sustrans Website Here – Route 51, for example goes from Oxford, through Milton Keynes and Bedford to Cambridge and then on to Felixstowe! What’s really amazing is that they are (way)marked with pointers at every turn and the whole thing is maintained by volunteers! So you don’t really need a map, you can just follow the signs (usually on lamp posts) as in the picture. If you’re following an NCR route it’s a good game for kids to get them to spot the next sign – well my kids used to like it anyway. If you’re starting at the Caldecotte Arms you can either go around the lake (see above) or take the shortcut over the Bletcham Way bridge. If you do, follow the lake down until you come to the Watersports centre and then turn left along the redway. This will take you around to the medieval village and Ichthyosaur Park (see above) and after a 100m or so to Bletcham Way – where you turn right to follow the redway under the V10 (Brickhill Street). The new Brickhill Street was, of course, built as part of the Milton Keynes grid, but the old Brickhill Street actually followed the path of (now) Walton Road from the Watling Street to Newport Pagnell. It was a major route and a great source of revenue for Caldecotte until they built the Turnpike road from Hockcliffe, through Woburn and Wavendon to Newport, and the loss of passing trade is thought to have led to the decline and shrinkage of the medieval village. Keep following the redway passing the Tillbrook Trading Estate (on your right) until you cross Bradbourne Drive. Tillbrook looks a bit boring, but in fact it contains some major employers head offices such as Yamaha Music, Trek Bicycles and, of course the world famous Red Bull Racing F1 team. Immediately after Bradbourne Drive you need to turn rightat the green Parks Trust sign to enter the Caldecotte Brook Linear Park – it’s easy to miss this turn as it looks like it’s just a boardwalk over a pond. You are now going to follow the brook for about a mile along the Linear Park. The Caldecotte Brook used to be the boundary between Bow Brickhill and Walton. It was changed to run along the railway at the creation of Milton Keynes. It doesn’t matter which way you go much as you’re following the brook, but I usually keep it to my left. On a nice day you wouldn’t believe you were travelling through a housing estate – it fees so rural. You will, after about 5mins come to a Tesco Express. Not far from here, in Hindemith Gardens, was the site of Old Farm, the original farmstead that Old Farm Park estate is named from. Carry on along the brook until you cross Boyce Crescent and about 100m after you will come to a T-Junction. If you turn right here you’ll be following the old footpath/green road over the railway to Bow Brickhill. Turn left across the bridge and start going up the hill to Wavendon. We are going to go straight up the hill to Walton Road, but about 50m after the bridge, on your right, you’ll see a rather overgrown entrance to an ancient road. This is Phoebe Lane – both the main access to the Old Farm and the traditional way for locals to get from the Brickhills to the village. You can, if you wish, take this route to emerge in the centre of Wavendon. It’s quite passable on a bike (would make a great redway) and is little used so you could be the first people up there for several weeks. The hill to Walton Road, by the way, is quite tiring so you may like to have a rest half way. At the top of the hill you’ll enter Walton Road opposite a modern gated entrance with an imposing avenue of trees leading away from you. This was once the Walton Road entrance to Wavendon Tower. Now the offices of an IT company, Wavendon Tower was originally built as a Manor House but during WW2 was used by the Secret Intelligence Service (SIS) as a recording studio for black propoganda. Later it became the headquarters for Milton Keynes Development Corporation, so the whole city was designed and built from here. Turn left onto Walton Road and cycle for 100m until you come to a junction with Passalewe Lane turn left here (it’s really straight on) and carry on down Walton End and over the Tongwell Street at Fyfield Barrow to Walton High School. Note that you will now be following NCR51 until you get to the Ouzel Valley so look out for the waymark signs. As you go past Walton High (and The Venue Theatre) note the woodland on the right. You may think this is just a bit more MK landcaping, but this copse has been here for hundreds of years. It must contain some ancient trees – although I’ve never actually been in it. Turn left onto Hindhead Knoll until it becomes Walton Road again. A short way along here the road splits and it’s worth a quick diversion onto the green area to your left to see The Snail Park – a childrens play area with another piece of public art – several Giant Snails! Returning to Walton Road follow the NCR51 signs through Tatling Grove and under the H9 and V10 until you come to a small lane (Milton Road). Although little used now this once was the main route of Brickhill Street. Cross Milton Road and head down Church Lane to Walton Drive and divert right here to visit Walton Hall and the Open University. This is private land but you are allowed to go here. 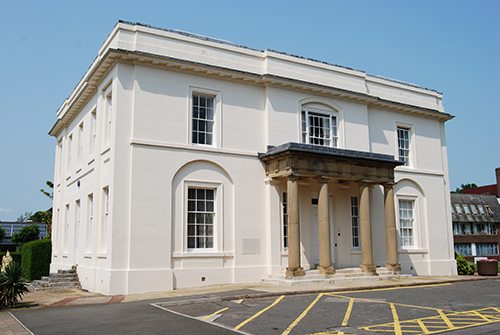 At the top of Walton Drive is Walton Hall which is the original Manor House for Walton Manor. The OU has a large collection of public art on the campus and you are encouraged to view it. They even have a Sculpture Walk Guide to help you around. My favourite, though, is Contemplation by Tom Harvey. This is a huge Cedar Tree that has been carved into a giant sculpture which represents learning in its simplest form using observation of the world around us. Kids love to see the fox chasing the rabbits on The Bench (also by Tom Harvey) which is next to it. Return to Church Lane and turn right down the hill to cross the Ouzel bridge and turn left towards Caldecotte Lake. Follow the cycle path up the valley, keeping the river on your left, until you come to Simpson Bridge where you dogleg left and right into the car park. The path continues at the bottom of the car park and returns you to The Caldecotte Arms. If you started elsewhere you should decide here whether to do the full circuit of the lake or simply follow the route around the northeastern side.